Eco-Art is comprised of contemporary artists and artist collaborations in the fields of environmental and ecological art. The show is intended to awaken interest in the outdoor environmental art phenomenon indoors at a museum site. The Pori Art Museum has a long history of exhibitions that reveal strong commitment to the art/nature dialogue. American sculptor Fred Sandback was an iconic figure in American art of the postwar period. Fred Sandback’s sculptures, delicate line constructions largely made from acrylic yarn, form simple geometric shapes that explore the physical relationship between the sculpture, its surrounding architecture, and the viewer. The Project Room at the Pori Art Museum is transformed into an educational experimental space. During the spring season, works from the collection of the Maire Gullichsen Foundation are examined from a variety of perspectives, and an exhibition of them is curated together with the audience. The process and the exhibition are planned by the Pori Art Museum’s education unit. JIMMIE DURHAM, GEOFFREY HENDRICKS, NYTE RY, S.E.L. 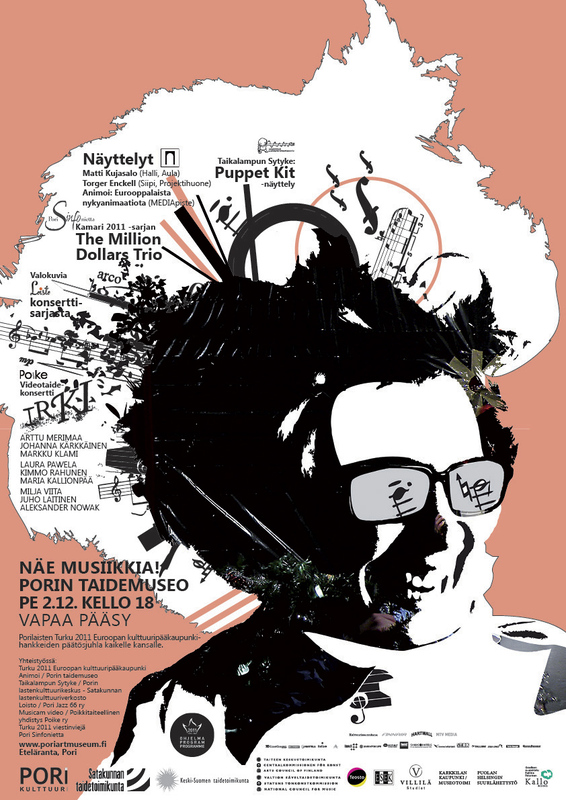 A selection of performances, which have been performed in Pori Art Museum during the years. Geoffrey Hendricks performed together with his assistants Kaisu Koivisto, Erja Lehtonen, Henry Merimaa, Sinikka Santikkko, Anna Teponoja, Henrik Teponoja (Nyte ry) Flux Navy -performance and a Fluxus Concert at the opening of his exhibition in Pori Art Museum 12.3.1994. Jimmie Durham’s performance at the opening of his exhibition in Pori Art Museum in September 1997. NYTE performed Juhlatanssi performance at a New Year’s Party (1.12.1991) in Pori Art Museum. A performance that NYTE performed on the 60th anniversary of Pori Theatre 11.10.1991. NYTE performed Poru-Aktio performance 31.08.1990 in Eteläranta, Pori. NYTE performed Jäähäät performance on Pori market square together with mieskuoro Huutajien kanssa 01.01.1991. A performance by a Lithuanian artist group called S.E.L. (Super Ex Libris) in Pori Art Museum 11.01.2000. Performers: Tomas Geciauskas, Sigitas Lukasuskas and Sigitas Staniunas. Sound artists Sarunas Tamulatis and Rytis Tankevicius. In co-operation with: Nyte ry/ T.E.H.D.A.S.ry, TAIK, Pori A-I-R –Artist in Residency,Pori Art Museum education unit. Internationally known environmental artist Andy Goldsworthy will be shown for the first time in Finland, with a large screen construction made from cattails collected in and around the Pori area. In co-operation with: Galerie Lelong (USA), British Council (Helsinki). Andy Goldsworthy will lecture about his work at Ateneum Art Museum (Helsinki) Saturday, June 11th 2011 at 15:00, free admission. Cevdet Erek, Erdem Ergaz, Gözde İlkin, Koray Kantarcioğlu, Ekrem Yalçindağ, Gamze Özer. Istanbul is among the biggest urban agglomerations in the world. Istanbul is also the melting pot between Asia and Europe – the Orient and the Occident – and its diversified and rich history spanning over two thousand years is present in the whole city. On this ground a strong and international art scene has developed at the Bosporus in recent years. The exhibition provides an insight into one part of this lively development. In co-operation with: ArtSümer Gallery (Istanbul), Dirimart (Istanbul), Galeri NON (Istanbul), Turkish Embassy (Helsinki). Works selected from the collections of the Maire Gullichsen Foundation are paired with contemporary artworks.What meanings arise when a work of art enters into dialogue with another work? Expressive butoh influenced movement, heavy improvised music and sport meet on the wrestling mat. Animate is an exhibition series produced in cooperation with the Pori Art Musem and the Turku Art Museum. It presents Finnish and International contemporary animations. The series examine the role of animation both as part of Finnish and international art, and as an independent art form. In co-operation with: Turku Art Museum, the Animation Degree Programme at the Arts Academy at Turku University of Applied Sciences, Turku Capital of Culture 2011 programme. Torger Enckell, whose work is featured in the collections of the Maire Gullichsen Art Foundation, was one of the key figures among the internationally oriented Swedish-speaking modernists in Finland. Today Enckell is known best as a colourist. The central theme of his work is man, investigated in the form of portraits, character studies and self-portraits. The exhibition presents Torger Enckell´s paintings from the start of his career in the 1920s and up to the 1970s. Matti Kujasalo has said that the purpose of a painting is to raise questions and experiences in the viewer. One of the internationally best-known artists in Finland, Kujasalo has in the course of more than four decades systematically developed his thinking based on constructivist art. He has built a visual grammar with its own particular rules. It is at once sensitive and powerfully expressive, mercilessly logical and startlingly full of surprises. Maria Kallionpää, Markku Klami, Johanna Kärkkäinen, Juho Laitinen, Arttu Merimaa, Aleksander Nowak, Laura Pawela, Kimmo Rahunen, Milja Viita. Local cultural projects, which have been produced for the Turku European Capital of Culture 2011 event.